Waking with a headache or a sore jaw isn’t the ideal way to start the day. But for the 10 to 15 percent of us who suffer from bruxism, the pain and soreness of teeth grinding and jaw clenching can be a daily inconvenience. But it doesn’t have to be. Although the causes of bruxism are fairly complex, protecting your teeth from wear and reducing discomfort can be as simple as popping in a night guard before you fall asleep. And with your dentist’s help, your mouth guard can have the best fit and highest comfort level possible. Many people with bruxism aren’t even aware of it – the excessive teeth grinding and jaw clenching associated with the problem don’t exhibit symptoms in all sufferers. But for those who do experience pain and soreness, bruxism can be a major inconvenience. Bruxism falls into two categories – sleep and awake bruxism. With the former, symptoms are at their worst upon waking and gradually improve; with the latter, they may not be noticeable on waking, but get worse over the course of the day. Men and women suffer sleep bruxism equally, although women suffer awake bruxism more frequently. Bruxism is associated with teeth grinding and jaw clenching, and can result in tenderness and inflammation of facial muscles, headaches, inflammation of periodontal ligaments, hypersensitive teeth, and excessive wear, chipping or fractures to teeth. Bruxism is typically first noticed by a sleep partner, who hears you grinding your teeth in your sleep. Although a diagnosis is usually simple, it’s important to see your dentist, who can determine of it is a simple case of bruxism, or if some other condition is causing your teeth grinding. In most cases, Merion Village Dental will prescribe you a night guard (also called dental guards, or occlusal splints) to manage the effects of bruxism. This custom-fit device is typically made of acrylic, and can be of varying degrees of softness or hardness. Your night guard can cover all or some of your teeth, depending on where your teeth grind, and to what severity. These guards can ease muscle strain by letting your jaws move more easily against each other, and they create a solid barrier between your teeth to prevent wear and other damage caused by teeth grinding. Getting fitted for your night guard is simple, and only takes one visit to the dentist. When you come in for your appointment, your teeth will be cleaned, and then an impression will be taken to create the custom guard. The night guard will then be ready after a few days. Creating your new night guard is simple and fast, and our professionals can gently and effectively walk you through the process. And during your appointment, our dentists will also inspect any potential wear or damage caused by your teeth grinding, and recommend any restoration work that may be needed. To schedule your next appointment, contact us online or call at 614-443-4400. 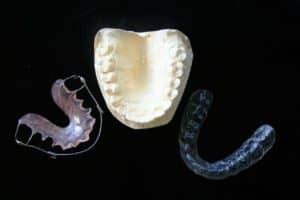 Learn more about night guards from Merion Village Dental here.